As the largest exhibition in the Middle East , with a comprehensive range of exhibits and industry conferences, 2019 Arab Health opened on January 28th at the Dubai World Trade Center. Medical device distributors and physicians from all over the world are coming to find suitable products and negotiate cooperation. In Exhibition, Micomme Medical brought Sepray home-care non-invasive ventilator and i series non-invasive ventilator and ozone disinfector for NIV. The booth attracted many visitors to stop,experience and consult. 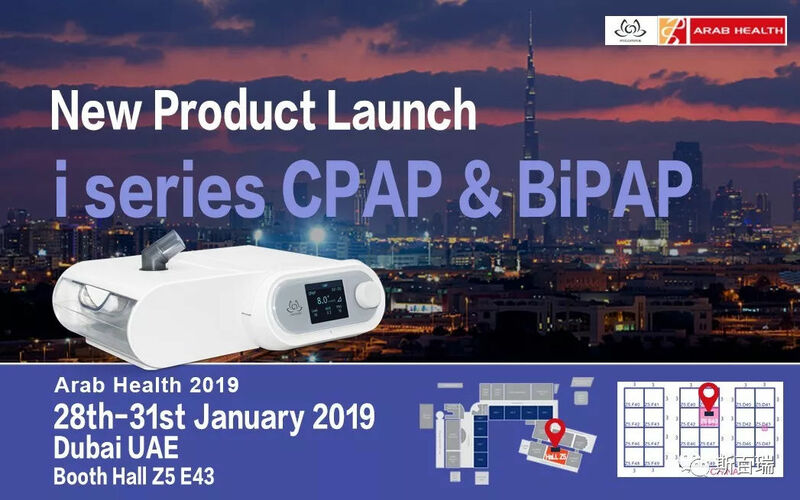 Our staff introduced the new i Series CPAP products to the visitors. Sepray home non-invasive ventilator has won the unanimous praise by the leading technology and excellent product performance. On the first day of the exhibition, the devices were all booked by the customers, some customers even paid the sample fee and asked to bring them back for testing. Some customers have had in-depth conversations with our staff and look forward to further cooperation. Through the Arab Health exhibition, we not only see the development trend and dynamics in the field of medical equipment, but also demonstrate our global influence in the field of respiratory medical equipment.